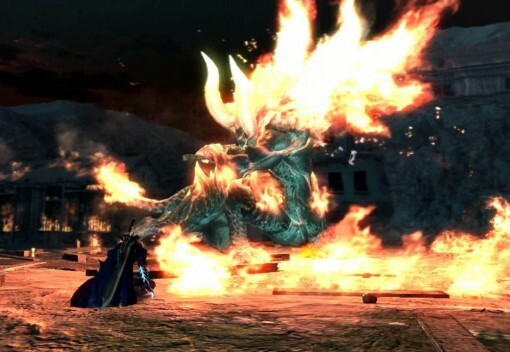 Devil May Cry 4 is excessive by design, from the mammoth swords to the boss battles rooted in elegant mayhem. The action can feel like a firework show that spurns a nuanced routine for a non-stop, thirty-minute finale, and there's a certain charm to this bravado. But the excessiveness takes away just as much as it gives. The structure of the extended campaign works against its own momentum, forcing you to retread recently explored locations and battle all-too-familiar enemies over and over again. While this Special Edition provides slight combat tweaks and additional characters to toy with, there's just not enough mechanical or architectural variation to justify the fluff. As a result, the endless combat rooms and recycled scenarios can be exhausting. The re-progression is thematically justified by a character swap, giving you at least some reason to remain engaged during this slog. You spend the majority of Devil May Cry 4 with Nero, a silver-haired, sardonic punk whose emotions swing from caustic rage to lovesick sweetness at the drop of a sword. He's a suitable protagonist for the series, with enough emotional intrigue to carry the early portions of the story, but the eventual shift to Dante is welcomed. Collecting new weapons and experimenting with his unique combat stances spices up the action, and his comically blasé attitude toward towering demons hurling fire, ice, and everything in between adds an additional layer of absurdity to this ballet of angels and demons. It's just a shame that Dante is left with so little meat to pick off the bone, being relegated to retracing Nero's steps. The Devil Bringer can transform even the toughest of foes into pretty blue explosions of light. The most significant change introduced by the Special Edition is the inclusion of three additional characters: Lady, Trish, and Vergil. The fresh cast is playable from the start, and thankfully, each member provides a much-needed layer of combat variation absent from the original release. Lady’s proclivity for projectiles punches up your offense at range, allowing you to more easily dust airborne foes and wipe out large groups with a single, charged missile. Trish and Vergil aren’t as unorthodox in their play styles, but both benefit from swift hypersonic attacks that help you smoothly transition from demon to demon. Vergil, especially, can quickly jump from place to place and easily build upon a string of combos without having to waste time walking to a new target. Devil May Cry 4 is deeply flawed, but the new 1080p, 60 frames-per-second wrapping provided by the Special Edition does well to modernize the aesthetic while maintaining the series' blistering speed. The action rarely skips a beat--even when a sea of enemies floods the screen--and while you might not mistake it for a brand-new 2015 release, the characters and environments just look cleaner. The uproariously extravagant cutscenes, where you'll find Dante and Nero elegantly sliding under deadly projectiles or bouncing away from massive demons with aplomb, benefit the most from the improved visual fidelity. Nero is like a younger, moodier version of Dante. But like a stubborn wine stain, the repetition so deeply rooted in Devil May Cry 4's fabric can't be easily washed out. The additional characters replace Nero and Dante in the same scenarios, so you're still playing through identical missions you're likely already tired of. 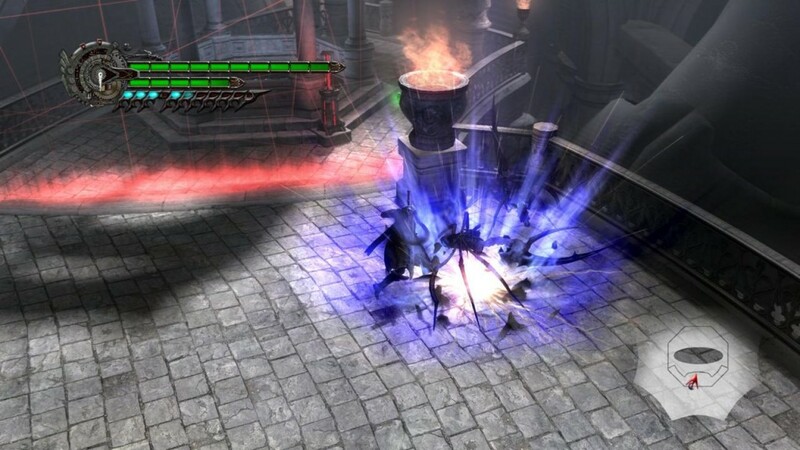 Starting the game over with a different character only highlights the lack of unique locations, so once the initial wonder of Vergil's lightning-quick technique and Lady's devastating grenade launcher wears off, there's not much left to enjoy. You can avoid replaying the main missions by instead testing out each character’s abilities in the Bloody Palace, which is a series of combat challenges where the deeper you descend, the more difficult the enemies become. However, Devil May Cry 4 can already feel like a combat gauntlet, so stripping out the story, puzzles, and exploration doesn't do it any favors. It’s nice to have more options, but the Special Edition's prevailing new features are hampered by the nature of its main adventure. The series of events is both interesting and challenging the first time around, at least--even if they're weighed down by too many back-to-back combat sequences. Nero's combo-driven sword-play is bolstered by his pistols and wonderfully versatile Devil Bringer--a demonic arm that acts as both a quick means of transportation and a powerful melee option. Beyond its practical use, the Devil Bringer gives you greater opportunity to increase your style gauge and extend combos to great lengths. By diversifying your attacks, you can earn more points and, most importantly, complete a combat scenario in the most surgical, exciting ways possible. Like a stubborn wine stain, the repetition so deeply rooted in Devil May Cry 4's fabric can't be easily washed out. You can grab, pull, and pound enemies into the dirt through Nero's glowing grip, but the manner by which this arm translates to platforming and puzzle solving is more frustrating than fun. Devil May Cry 4 provides very limited camera control, and shifting perspectives often obfuscate your view as you use your arm to grapple from point to point. It can be difficult to determine your position, let alone time a jump or push certain objects to unlock doors with such a restrictive, jarring point of view. If you're a seasoned demon hunter, the Special Edition does provide a new, punishing difficulty called Legendary Dark Knight Mode. Here, a greater number and variety of enemies spawn at any given time--creating more opportunities to string together stylish combos, but a higher probability of becoming overwhelmed. Thankfully, the points and skills accrued over time carry over, so some of the difficulty's edge can be dulled by tackling this hellish challenge on a second playthrough. However, no matter how skilled you become, the boss battles here can be ruthless, so even fully decked-out characters can fall after a few mistimed dodges. The boss battles are beautiful, but sadly, you’ll have to see each of them three times. The visual improvements and additional characters layered atop the Devil May Cry 4 Special Edition can't conceal its bloated structure. This is, without a doubt, the best this stylish action romp has looked and felt, but just because you can gussy up an old game, doesn't always mean that you should. If you're dying to see how Vergil fares against the Order of the Sword or feel the need to test the extreme difficulty, take the leap. Just be warned that some aspects of the game would have been better left in the past.